Are you buying or selling your home? Moving to a new apartment? At Home Maid Service Inc., our experienced cleaning professionals have extensive experience with move-in and move-out cleaning in the Gaithersburg, MD area. With one call to us, you'll discover why more people choose us for the cleaning services that they need at a price they can afford. You can depend on our trained professionals to provide high quality move-in and move-out cleaning, making your next move a little easier. Before you move in or move out of your home, contact us today! We offer comprehensive move-in cleaning services that will leave your new home, apartment, or condo sparkling like new! Our professional cleaning staff will thoroughly clean and disinfect your new home to make it move-in ready! Since houses and apartments can accumulate years of dirt and grime without regular deep cleaning, move-in cleanings provide you and your family with a stress-free way to start life in your new home. Moving out of your home or apartment is hard work. Sometimes, there is not enough time to properly get your cleaning done. If you are renting a home, condo, or apartment, hiring a professional cleaning company may be the fastest and easiest way to avoid problems with your landlord and get more of your damage or security deposit back. We can provide you with high-quality and affordable deep cleaning services for your new home or apartment. Unlike many other cleaning companies, we treat your new home or apartment with the respect and care it deserves! For more information about move-in and move-out cleaning at an affordable price, contact us today! 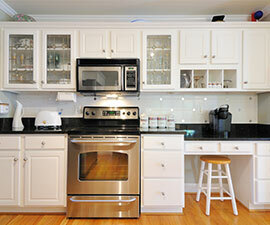 Contact Home Maid Service Inc. to schedule your appointment for move-in/ move-out cleaning. We clean homes throughout Gaithersburg, Rockville, Germantown, Urbana, Clarksburg, Silver Spring, Chevy Chase, Bethesda, Monrovia, and Olney, MD.